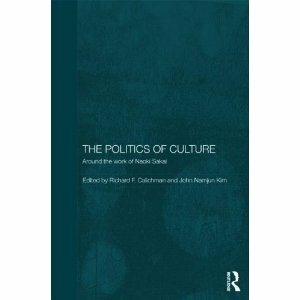 The Politics of Culture: Around the Work of Naoki Sakai, edited by Richard Calichman and John Namjun Kim, has just been published. An exploration of one of the most interesting theorists working in Japanese cultural studies (and one of my own mentors), the volume contains new essays by scholars from a variety of fields–including yours truly. My own piece is a re-reading of Natsume Sōseki’s 1908 novel Sanshirō in relation to Sakai’s philosophical approaches to the questions of language and translation, as I trace the meandering paths of a number of stray sheep–both literal and figurative. My own copy hasn’t shown up in the mail yet, so I can’t tell you a great deal about the other essays yet, other than that they are by some of the most interesting people I know. At $130 a pop, you might want to ask your rich uncle to buy the book for you, or perhaps borrow it from your local university library. But anyone with an interest in the theories of translation, subjectivity and nationalism will, I’m sure, find it a provocative and challenging read–much like the work of its subject, Naoki Sakai. The publisher’s homepage on the book is here, and below is the table of contents. 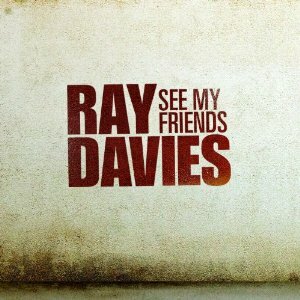 Head Kink Ray Davies’ new album will be released in the UK on November 1. See My Friends will consist of duets with a variety of musicians, covering Kinks’ Klassiks from the Katalog. The U.S. release date is still unknown, but there are hints of a U.S. tour near the end of this year. Last night, we took in the last of Aimee Mann’s weekend shows here in Chicago. It was our first visit to the Old Town School of Folk Music concert hall, a compact little room with great sight lines and sound. The entire weekend was sold out; the crowd was mostly old (like myself) and took a little while to get loosened up, but Aimee’s painfully beautiful songs won them over and earned enthusiastic standing ovations at the end. I’ve been a fan of Aimee’s music for twenty years, but this was the first time I’d seen her in concert. She has a kind of skitterish stage presence, an absence of polish that begins to take on its own charisma as you get used to it. Through the course of the evening she carried on a running gag about what it meant for her to playing in a school of folk music. She opened the show with a solo version of “The Moth,” but then was joined by Jamie Edwards on keyboards and Paul Bryan on bass (both also sang harmony). No drummer, though Aimee did tap on a high-hat cymbal during one number (and she and Edwards dueted on recorders on another). She was in magnificent voice all night, the only signs of strain coming on a few very low notes near the end of the concert. The core of the set list consisted of a series of tunes from the musical she is currently composing based on her terrific 2005 concept album The Forgotten Arm. This included three new compositions, including the stunning “Easy to Die,” which Aimee described as the most depressing song she’s ever written. The regular set closed with several songs from the Magnolia soundtrack, including a fine jazzed up version of the old Harry Nilsson, Three Dog Night hit “One,” with pianist Edwards vamping away. You know how when you’re a longtime fan of a musical artist, over the years you fade in and out. I’ve been following Aimee Mann for nearly two decades now, but lately I’ve been on a “fade out” cycle. I haven’t much listened to her recordings the past six months or so. But in the lead up to last night’s concert, I started listening to the CDs again and remembering why I like them so much, and then the live show performed a kind of emotional rescue on my spirits after an inexplicably depressed weekend. Like a homeopathic remedy, Aimee’s melancholic songs lifted me out of my own melancholy, and I find myself in love with her music again. Like you, I’m currently reading Jonathan Franzen’s Freedom. (You are, aren’t you?). I have to reserve judgment on the novel as a whole until I finish reading it–and I’m a sssslllloooowwww reader these days–but in general you can color me impressed. As he did in The Corrections, Franzen presents a painfully life-like portrait of what Elvis Costello a couple of decades ago called “emotional fascism.” That is, he draws a finely detailed topographical map of the decline of American democracy, all as lived out in the privates lives of our psyches and families. 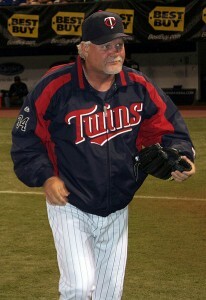 His choice of my hometown, the Twin Cities, for the opening scenes seems prescient, too. What’s happened to Minnesota over the past three decades presents in distilled form the effects of Reaganism, consumerism, and religious fundamentalism. Back in the 1970s the state was celebrated as the “Minnesota Miracle,” a bastion of progressive values and a can-do spirit, but now our bridges fall down, our schools disintegrate, and our families work two and three jobs so that we can cut taxes on the wealthy, buy incredibly cheap underwear made in Guatemala, and prevent gay people from marrying. That’s about as succinct a depiction of emotional fascism as you’ll find anywhere. So I like Franzen’s choice of setting. But I’m also gnawed at by the sense that he gets the external details wrong: the texture of daily life in St. Paul just doesn’t jibe with my own memories. It’s a bit like that typical scene in parallel-universe science fiction when the hero starts noticing little slips in the world around him and starts to wake from the illusion and realize that he has left home far behind. For example, the depiction of the Ramsey Hill neighborhood of St. Paul. Granted, I didn’t live there in the 1990s, but the portrait of the neighborhood just feels off. For starters, the renovation of that neighborhood largely took place in the 1970s and 80s, not the 1990s. Moreover, the kinds of municipal corruption and street life he depicts for it sound East Coast to me (or perhaps Chicagoan); we had corruption and crime in St. Paul, but it wasn’t of the genus that he depicts. Likewise, the scene set circa 1980 at the Longhorn, the legendary bar in downtown Minneapolis that spawned the Suicide Commandos, the Replacements, and a hundred other punk bands, is all wrong. For starters, Mohawks and safety pins weren’t the fashion of Minnesota punks, nor was pogo dancing a big deal. And I never ever saw a crowd at the Longhorn pack the front of the stage for a local opening band: for better or worse, that just wouldn’t have been cool. In sum, I’m pretty sure Franzen never set foot in the place. 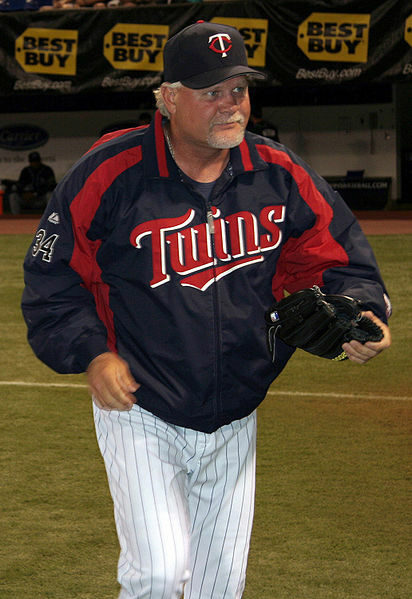 A couple of his major characters attend Macalester College in the late 1970s and early 1980s–as did I. I probably passed them in the dorm hallways and at Kagan Commons cafeteria. But they do and say the wrong things. One of them, for example, wants to find out where the “townie girls” hang out. I’m sure that expression was never used at Mac; the closest thing would have been “St. Kate’s girls,” referring to the Catholic women’s college a mile away, but even that meant something quite different from “townie girls” as Franzen’s fictional character uses it. So what do you do when your knowledge of reality interferes with your enjoyment of the dream of fiction? I guess you sit down and write whiny blog posts…. My first three summers in Chicago, something always came up on Labor Day weekend to keep me away from the Chicago Jazz Festival, despite my best intentions. I was bound and determined to catch at least one evening’s worth of performances this year–and, for once, it worked out as planned. We nearly froze to death: for the first time all summer, it was actually a cold evening, but as more than one person noted, this was well suited to the “cool jazz” we were enjoying. My teeth were chattering from the cold by the end of the evening. But I am delighted to have finally attended the Chicago Jazz Festival, and I look forward to many return visits in the future. Next year, I’ll try to remember to bring a jacket. I’m a little behind the curve on this story, but the Neojaponisme website has a fine postmortem report on the the recent closing of the HMV Store in Shibuya, Tokyo. W. David Marx analyzes the shifting role the influential music retailer played in the years after it first opened in 1990, becoming headquarters for what came to be called Shibuya-kei rock. The shop later lost its unique position of authority, however, and Marx suggests that its demise is due less to the rise of digital file-sharing and more to tectonic shifts in the structure of contemporary Japanese youth culture. As he aptly notes, “Popular music, more than ever in Japan, is an expensive hobby,” and after paying their cellphone bills kids today simply don’t have that kind of money to throw around. In my reading recently I’ve been haunted by the devil. For example, he shows up, albeit ambiguously, in Charles Baxter’s fine 2008 novel, The Soul Thief. The narrative, written with Baxter’s usual intelligence and style, traces the life on one “Nathaniel Mason,” as told in the first person–or, perhaps not. It might be that Nathaniel is dead and his place has been taken up by a psychopathic mimic, ala Norman Bates in the film Psycho, which is alluded to repeatedly (we even get a creepy motel scene at the end). Or perhaps Nathaniel is none other than Satan himself–another possibility deliberately raised. The first half of the book, detailing Mason’s younger days as a grad student in Buffalo, New York, is especially strong, as good as anything Baxter has written. So I finish that novel and then in all innocence move on to Muriel Spark’s The Ballad of Peckham Rye (1960). Here, the central figure is Dougal Douglas (or, sometimes, Douglas Dougal), and again the narrative strongly suggests that the protagonist has more than a bit of devilry to him. He even invites people to touch the two bumps on his scalp where his horns were surgically removed. It’s a terrific comic yarn about the dark powers of the humanities to disrupt the social order. Douglas is a recent “Arts” graduate hired by an industrial firm in South London that fears it is falling behind the times in its failure to carry out “human research” on its employees. Once he arrives all hell breaks loose, literally: weddings fall apart at the altar, loyal workers start skipping shifts, and young men take to battling it out in the streets. The Christian undertones are missing, but there is more devilry afoot in another work I’m reading just now, Okazaki Kyoko’s awarding-winning manga, Helter Skelter (serialized 1996, published in book form 2003). The heroine is a beautiful fashion idol who becomes increasingly cruel and cold to those around her as the surgery, drugs, and manipulation that artificially generate her desirability take an increasing toll on her person.